As national attention turns to issues of diversity and inclusion, it is important to keep the youngest learners in our country at the forefront of educational policy making decisions. Hispanic children account for the largest proportion of minorities among children ages 5 and younger in the US, and many of their families do not speak English at home. These children require specialized attention and focus to ensure their needs are met academically, socially, and emotionally so that they thrive as learners today and productive citizens tomorrow. Incorporating their cultures, language, and traditions into the classroom is important not only to guarantee equity, but also to acknowledge the contributions their diversity makes to education systems nationally. Supporting diverse learners can only be done, however, with data about who these children are. Programs and policies must engage families and craft guidance that supports teachers and children alike. 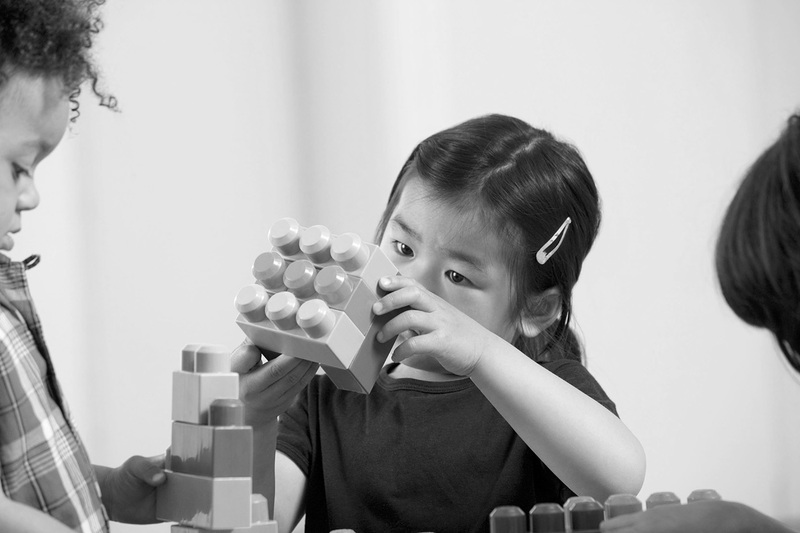 NIEER estimates that 19% of 3- and 4-year-old DLL children attend a publicly funded preschool program based on information shared by 21 states; this is down from 23 states that were able to report specifically on rates of enrollment for DLLs in their state preschool programs in 2015. Data on enrollment, and this demographic variable in particular, are crucial if states are to make sound decisions about how and where to allocate resources supporting DLLs. States are aware that DLLs account for large proportions of their populations. Thirty-three programs in 25 states report supplying recruitment and enrollment materials in languages other than English. Yet, while states actively recruit DLLs to participate, the supports they offer once children enroll are not consistent with recent recommendations from the field. 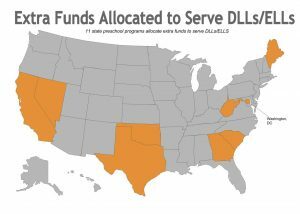 The following map shows the nine states earmarking funding to support DLLs in preschool. While it’s promising that several of the states identified serve the highest proportion of DLLs, such support should be provided more consistently across states as an intentional effort to improve the academic progress of young DLLs. Funds allocated specifically for DLLs could be used in myriad ways. For example, in examining language of instruction-related policies, few states report specific strategies used systematically (in policy), respective to how DLLs are educated to both maintain their home language and become proficient in English. The most common policies reported by states allow programs to conduct dual language immersion or bilingual instruction, but this does not guarantee in any way that states are actually guiding, requiring, or managing programs explicitly into these practices. To intentionally guide policy relative to DLLs in early childhood education, states must consider how children are identified as DLLs. Whether they are assessed in both their home language and English or in English only, for example, affects how teachers/programs determine language proficiency versus language delay issues. During the 2015-2016 school year, nine states report assessing children in their home language and 22 states report allowing districts to locally determine how to identify DLLs based on English-based assessments/screeners. Again, without consistency on even the identification of who is a DLL and who is not, states cannot determine clear-cut policies to support these children in a systematic way. New federal legislation, the Every Student Succeeds Act (ESSA), provides states an opportunity to include planning for funding devoted to DLL-specific supports. NIEER’s State of Preschool 2016 report found a lack of program oversight relative to DLLs in many state early childhood education systems. Just 14 states report a requirement for systemic written plans to be in place and approved for how to work with individual DLLs and only eight report monitoring the actual quality of bilingual instruction. A lack of information hampers efforts to enhance the quality of education for DLLs. Collecting data about DLLs or having a system in place to incorporate quality for DLLs such as QRIS, could increase the relevance of this issue by prioritizing it as equivalent in importance to other more general measures of classroom quality. A key feature of effectively enacting many of these policies is having a diverse workforce, including bilingual educators and monolingual educators specifically trained to work with young DLLs. NIEER research found in 2015-2016 only four states require lead teachers to have specialized credentials for working with DLLs. Again, while states report the inclusion of Early Learning Development Standards related to serving DLLs, only 29 states report providing professional development or coaching for teachers of DLLs–and still the content or strategies offered is unknown. Funding devoted to in-service professional development relative to DLLs, including hiring bilingual coaches, would be important. In line with this, one glaring data point that surfaced this year is that only one program, the California State Preschool Program, requires that program administrators hold specialized credentials for working with DLLs. Given that administrators are responsible for teacher oversight, the absence of widespread guidance is concerning. National Research Center on Hispanic Children & Families research recently highlighted that programs serving large Hispanic populations fare better than most on several of the data points NIEER surveys for our Yearbook. Yet while these findings are promising, it is critical to note that such effective practices will never become widely available without the authority of state policy. Policymakers should look to scale up practices that celebrate diversity and enable all children to reach their potential, recognizing that investing in DLLs benefits not only these children, but also our collective progress as a nation.